The Tate Gallery’s exhibition ‘Pre-Raphaelite: Victorian Avant-Garde’ which continues to 13th January 2013, has been a cause for a certain re-examination of what is considered ‘good’ artwork – with Rachel Campbell Johnston (Times) deeming the Pre-Raphaelites ‘the cutting edge of art’, and Alasdair Smart (Seven Magazine) describing the era as the ‘Marmite movement’; it evokes either love or hate, and in his opinion, namely hate. Visually, the Pre-Raphaelite movement appears as an extended exploration of aesthetics; the works of ‘Ophelia’, ‘Mariana’ and ‘The Lady of Shallot’ stem from the poems of Lord Alfred Tennyson. The Victorian period saw a merge of art and literature in the form of a cultural pool. Both disciplines worked from the inspiration of classicism and medieval chivalric romanticism – taking interest in the idea of the self and the introvert, the boundaries between the realms of fantasy and reality, and specifically channeling such psychological examinations through the aesthetics of woman. The female figure is ceaselessly tragic and most importantly, unobtainable. In the case of John Waterhouse’s ‘The Lady of Shallot’, the heroine figure radiates grief – an oxymoron which maintains that the Pre-Raphaelites had the power to express pain and beauty simultaneously, whilst all the time elevating even the fallen woman. The idealised woman (featured in the works of Waterhouse, Millais and Rossetti most prominently) is charged with eroticism, self-absorption and fatality. Tennyson’s ‘Mariana’ is trapped within a static microcosm, which she seems to have self-constructed, as she wallows and wails in an all-consuming grief. This is translated into Millais’ charcoal drawing of the heroine, whose face is covered in a sense of Victorian hysteria and melancholy despair (the drapery of her costume is almost personified; it’s dramatic flamboyance is reflective of her mood). The works are not simply romantic, but engaging on moral, political and social levels. 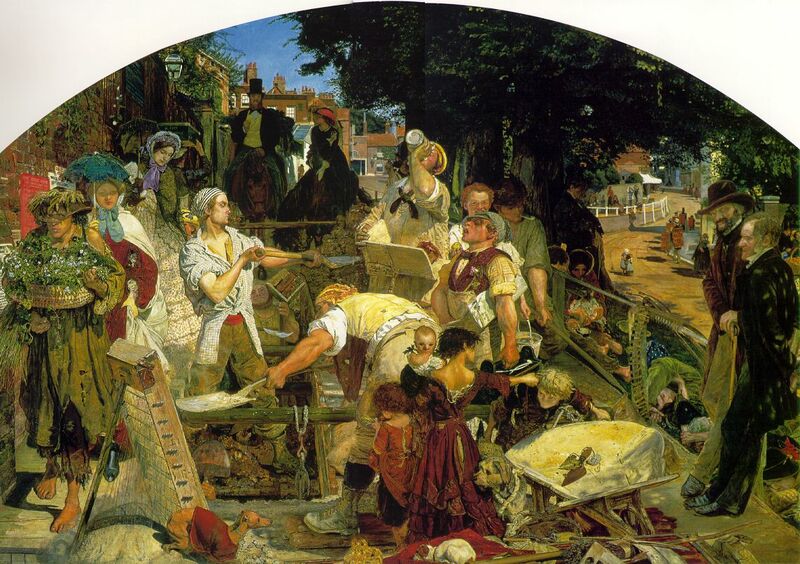 Ford Maddox Brown’s ‘Work’ is a brutally realistic depiction of clashes within the Victorian class system, made up of dichotomies between poverty and richness, the painting is one of social realism. The Pre-Raphaelites were much more than garish chocolate-box painters. They employed traditional and classical subject matters following themes of medievalism and romantically symbolic concepts, yet this does not mean that they were classical and traditional in approach. By looking to the past and renouncing the art of the period, the artists were essentially rebels. Maybe Smart is right; perhaps it is a ‘Marmite movement.’ Either way, I love it.